Hope you are well and not going too crazy with wedding season!!! I know that Tegan and Matt have been in contact with you, however Peter and I just wanted to personally thank you for everything you did to make their wedding so special – it was just an amazing day which our whole family will never forget! What beautiful memories were made there at All Smiles on 25th February! 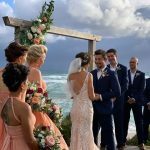 What a special Wedding Coordinator you are – from collecting SA wine at the Sorrento Post Office before we all arrived, to the meetings with Tegan and Matt, a huge number of emails from Tegan! Setting up the venue just as they wanted, the beautiful ceremony, fixing up the make up on Matt’s suit, looking after all the guests and finally organising for everyone to find transport home! I’m not sure if you heard much of my speech – but I did genuinely thank you for everything and mentioned that you were such a special person – as you may recall I work in tourism here in Victor Harbor and there are not many people around who are so dedicated to their work as you are! I did call Dean from your head office prior to leaving and let him know how amazing the day was – and hoped that he realised how much you contribute to his business! Tegan and Matt are overseas at the moment and will be back mid-May so we will be having a photo day and video viewing when they return. I think they have booked to return to Sorrento to celebrate their first anniversary – watch out because Tegan will not be wanting to leave again! I have mentioned to quite a few people I work with about All Smiles so you may even see a few of them call by – I did tell them to ask for you especially if you happen to be on duty. Hopefully someone may book another wedding with you! Thanks again for everything – we are certainly hoping to visit Sorrento again in the future and will be sure to call in to All Smiles!